Breakfast: Eat it or not? And if so, what? This morning I poured myself a cup of tea – with Hypocritical Milk in it, yes – and considered the prospect of breakfast. From my childhood I’ve been hearing that breakfast is the most important meal of the day. 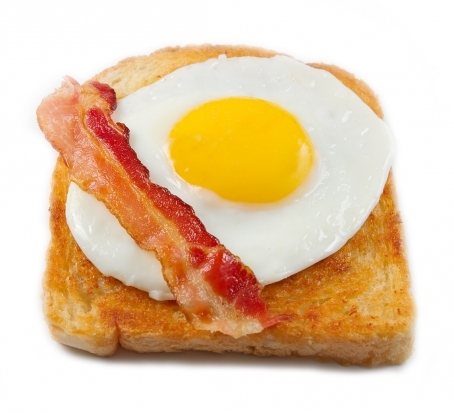 Articles tell us we must eat breakfast to be healthy and keep our weight down. Studies have shown… of course there’s a study to prove practically everything, but studies have shown that people ought to eat breakfast. It’s the Accepted Thing. However, this article from StrongLifts.com is all about reasons why you should not eat breakfast. And not just if you’re a weightlifter. Now, I have nothing against breakfast eaters, nor against breakfast itself. I find that breakfast, eaten at least two hours after I get out of bed, can be a pleasant and healthful experience. But I am not the Morning Person I’d like to be, and I know better than to try to get breakfast into me before I head off to work. The ensuing nausea cancels out the health benefits. My insides just don’t want to deal with food that early in the day. Sometimes I eat a handful of nuts and a couple of dried apricot halves at around 10:00am, and don’t have anything else but tea until lunch time. But usually I skip the morning food thing altogether. Because, bottom line, I hate feeling like I’m about to throw up. But when it’s the weekend, and I’ve got time, I like to eat breakfast. Which brings me to part two of this post: what should a person eat for the day’s first meal? Easy. It’s clear from this article that it’s best to eat a high-protein breakfast. It’s equally clear from this other article that it’s best to eat a high-carbohydrate breakfast. And from this third article, you can see that it’s best to eat a high-fat breakfast. Get the feeling that nobody really knows what the heck humans should eat for breakfast? Me, too. So when I do eat breakfast, it’s usually a bowl of soup. This entry was posted on January 29, 2013 by thinkreadcook and tagged breakfast, carbohydrates, carbs, Confusion, fats, nutrition, protein.